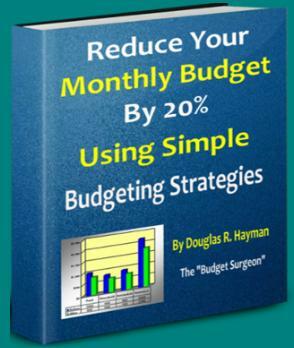 Reduce Your Monthly Budget By 20% Using Simple Budgeting Strategies is a unique, written-for-the-times eBook that takes a novel approach to Household Budgeting. It focuses on 90 well-defined, distinct strategies that can easily be implemented by anyone to drastically reduce one's household monthly budget by 20% or more. The author thoroughly addresses all avenues of spending in this book, and most importantly, emphasizes that a monthly budget should be treated as a business, and not as a hobby. If you are struggling to keep up with your bills and feel that your monthly budget has become unmanageable, you will seriously benefit from this eBook's concrete money-saving strategies and suggestions. Alternatively, if you are just looking for new ideas to help fine-tune and reduce your monthly budget, you will also find this eBook extraordinarily valuable. You can read an excerpt of our eBook by clicking this link. It is in .PDF format and requires Adobe Reader. 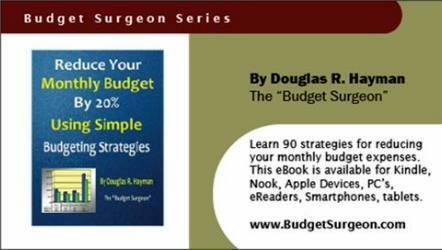 Douglas R. Hayman, known as the "Budget Surgeon" by friends, family, and colleagues alike, is a self-professed Household Budgeting expert. His eBook is a pure reflection of household budgeting techniques that he has successfully employed over the years to help reduce expenses, and to help fortify his personal financial balance sheet. Douglas is also the author of the Retirement Calculator, which is unique, state-of-the-art software that provides all necessary tools to calculate your optimal retirement date, and manage retirement information. Douglas has a Master's Degree in Computer Science and a Bachelor's Degree in Economics from Stony Brook University, in Long Island, NY. Douglas has been self-employed for the last decade as an author, affiliate marketer, real estate salesman, B2B technical lead generation salesman, stock and futures investor and trader, and Information Technology consultant. Additionally, Douglas has over 19 years of corporate Information Technology (IT) experience, most of which focused upon technical management working for an international Fortune 100 company. At this company he managed multi-million dollar departmental budgets. These consulting services are described fully on our Financial Consulting Services website. Legal Disclaimer: This publication is designed to provide general information regarding the subject material covered, and is a work of the author�s experiences and opinions. Although the author and publisher of this book have implemented all of the budgeting strategies in this book successfully, they make no promises or guarantees for similar results for any purchaser or reader of this book, spreadsheet and manual, and website. Results may differ based on an individual�s personal interpretation and implementation of the strategies outlined in this book, spreadsheet and manual, and website, and the author and publisher accept no personal or company liability for any of these results. Additionally, the author and publisher do not represent or warrant that any information, ideas, plans, actions, suggestions, and methods of operation contained in the book, spreadsheet and manual, and website are in all cases true, accurate, appropriate, or legal. It is the reader�s responsibility to consult with his or her own advisor before putting any of the enclosed information, ideas, or practices into play. The author and publisher specifically disclaim any liability resulting from the use or application of the information contained in this book, spreadsheeet and manual, and website, and the information is not intended to serve as legal advice related to individual situations. Additionally, the author and publisher accept no personal liability for any inaccuracies or omissions in this book, spreadsheet and manual, or this website. Finally, please be advised that there is no business or financial connection between the author and any companies or vendors mentioned in this book. directly from your Apple device. Adobe platform, and other tablets.